4"x4" FREE PARTED LACE CLOSURE	There are 7 products. 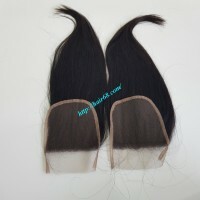 The Straight Lace Closures piece is the last piece needed to accompany your straight weave hair extensions. Closures are placed on your crown area to blend right in with your wigs cap. These closure hair pieces are easy to maintain and style and can be parted in any direction. These pieces will give you the crown confidence you've been looking for. It will make your hair to look like yourself. Our Closures have nothing but the best quality hair which was made from Vietnam remy hair with no chemical and no process, and will last through multiple installs. Our Closures will usually last 3-6 months if properly taken care of. Our Closures are not bulky - We make it depend on clients inquiries, who hand crafted and customized our lace silk base closures to our specifications. This is the single most important point that makes our closures different; the size is perfect (4" X 4"), and is designed in more of a square design rather than an oval design.